Last episode of Bitchy McBitcherson had me Cranky in Colorado, so we’ll be starting out there too. Seriously, the damn breakfast room attendant was too busy chatting with another employee to keep the food stocked and when she wasn’t doing that, she was watching the TV, which was on way too loud. Anyhow, the husband and I chatted and debated between drive two harder days, or three easier days. We opted for the 3 easier days, so I picked a stopping point in 460 miles. We got on the road with a plan of being at the Robbers Roost Motel by about 8:30 PM. We stopped in Idaho Springs for a late lunch at Smokin Yard’s BBQ. This was good. Surprisingly good. This was, I’d enjoy eating there for dinner good, and random stop mid-roadtrip it was totally amazing. While we were sitting next to the window stuffing our faces full of barbecued beast, we noticed all this white stuff blowing sideways past the window. Ash? What? Snow?! Yes, snow. When we finished up and got back outside, it had stopped. We took the dogs down by the river behind the restaurant, and gave them some time to stretch their legs. 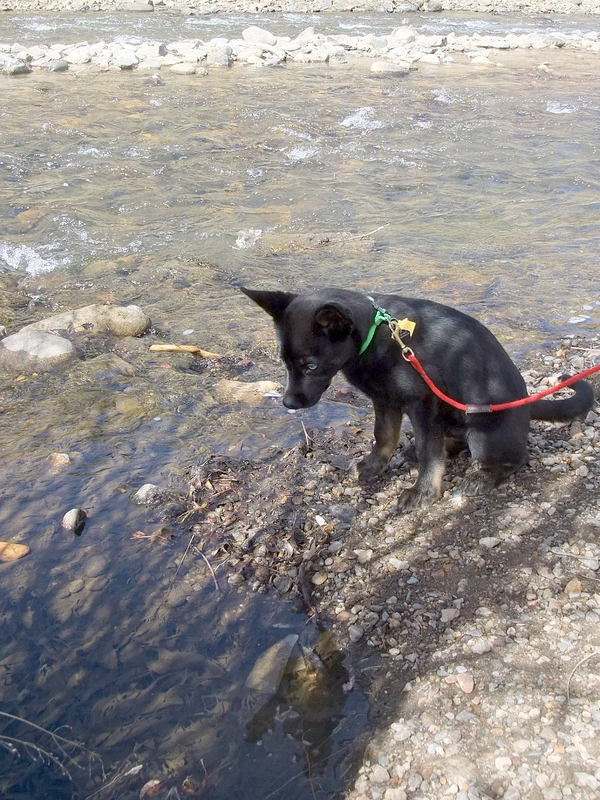 Watson checking out the river near our BBQ lunch stop. Then we loaded our stuffed selves back into the cars and began driving. Within a couple of miles we were driving in a little bit of snow. A few more miles rolled by and we were driving in a full on snow storm. Then, the plan exploded like Alderaan. You didn’t need to have any damn midi-chlorians to sense my spike in frustration levels. They closed the highway we were on, with no estimate of when they would reopen it. Our choices were to look for a room where we were, that would take two cats and two dogs, and eat the cost of the two rooms booked in Utah, or to take a long detour. We took the long detour. It only added an extra 100 miles to our drive, but it was 100 difficult miles through two lane winding roads. Our rate of progress was much slower. Plus, the place we were booked to stay had a cut-off time for check in, and we were racing the clock, very slowly, while trying to avoid hitting large herds of deer and elk. We finally made it back to Interstate 70 from our painfully scenic detour, and we were exhausted. Seriously, I had reached that state where I needed my passenger to talk to me about what was ahead on the road, because sometimes I could see two roads, and they weren’t going the same direction. I needed a bit of help following the one that was in the same reality that our vehicle was traveling in. Then it started snowing again. Hard. Snowing with big gusts of wind. The snow was mainly blowing straight into the windshield, but then the wind would send it swirling. It was like driving through a Star Tours hyperdrive special effect, and it was making me nauseous. It was at that moment that the cats decided they had truly had enough of each other, the car, and everything. They began screaming and hissing and trying to kill each other, right behind my head.